It's incredibly detailed, but that's still a hefty sum for a scale model. The Bugatti Chiron is a spectacular feat of engineering, powered by an 8.0-liter, 16-cylinder W16 engine that sends 1,500 horsepower through a seven-speed transmission. Sadly, not many of us will get to marvel at the hypercar’s mechanics, but you can now buy a 1:4 scale model of the Chiron’s quad-turbocharged engine and seven-speed transmission made by the UK-based company Amalgam which specializes in high-end scale models. At a glance, the scale model is so highly detailed that it’s hard to tell it apart from the real thing. It also costs a whopping $9,300, which seems hard to justify for a non-functioning powertrain. Apparently, this is the first model engine Amalgam has built since the early 2000s. The company worked closely with Bugatti to make sure every minute detail is as accurate as the real thing, and it certainly shows. Even the part number labels and barcodes are exactly the same as the real engine. It took a staggering 2,500 hours to design using Polyurethane prototyping resin, stainless steel, and pewter components. Each model takes 220 hours to painstakingly build from 1,040 individual pieces, which explains the astronomical $9,300 asking price. 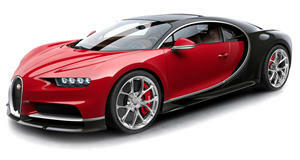 If you’re looking for a scale model of the actual car with the same absurd attention to detail, Amalgam also sells a 1:8 scale Bugatti Chiron for an eye-watering $10,160 – that’s a lot of money for a car without a functioning engine that will spend its life sat on your shelf gathering dust.